Dr. David Colvin, orthopaedic knee surgeon in Perth. The first few weeks after ACL reconstruction surgery are by far and away the most important in terms of the long term results. With all types of shoulder and knee reconstruction surgery, getting away to a good start can take months off the recovery time. Equally, getting away to a slow start can add months to the recovery. High pain levels will stop you from doing the necessary exercises. Successful pain control is achieved by taking simple painkillers (Panadol and anti-inflammatories) regularly and adding in the stronger narcotic painkillers as required. You can read more in my postoperative pain relief advice article. Swelling is part of the inflammatory response induced by the trauma of surgery. It causes joint stiffness and the muscles stop working. Swelling is treated with rest, ice, compression, and elevation (RICE). Wear a compression Tubigrip sleeve on the knee for as long as the swelling persists, which may be weeks. There is no such thing as too much ice in the early stages. Three to four 15 minute sessions a day is desirable. Excellent results can be obtained with the GameReady device used by professional sport teams. It can be hired through some physiotherapists. Achieving a completely straight knee (referred to as extension) is actually the single most important thing following ACL reconstruction surgery. However, to get it out fully straight, you will need to have your pain under control and reduce the swelling. Do an extension stretch exercise repeatedly throughout the day. If you are lying down or sitting, have the leg out straight with the heel propped on a pillow to gently force the knee straight. Remember that stretching exercises are a low load, long duration. Stretch and hold. A knee that does not fully straighten causes a permanent limp. 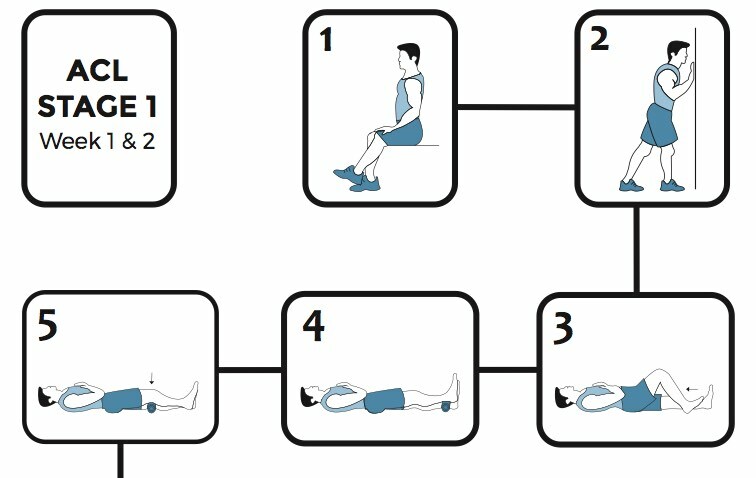 To assess your progress from week to week, lie flat on the bed and attempt to put a hand under your knee. By the end of week six, there should not be enough room to slide your hand easily between the back of your knee and the bed. The knee should be fully straight by the end of week twelve at the absolute latest. Difficulty with knee bending (or flexion) is much less common following ACL reconstruction surgery. It is very safe to bend the knee and the physiotherapist will have you onto the CPM machine day one after surgery. The bending won’t come back without some gentle pushing on your part. Start with the drop and dangle exercise in my rehabilitation program. Some people are apprehensive about damaging their reconstruction. This can be a mistake as it leads to inadequate rehabilitation and stiffness. The reconstruction is stronger than you think and won’t be damaged by forceful extension or bending in the early weeks. Kneecap pain (patellofemoral pain) is the scourge of ACL rehabilitation. Sometimes the kneecap is damaged with the original injury but more often than not, the kneecap pain is a secondary event because of tightness of the tissues on the outer half of the knee and weakness of the quadriceps which develops after surgery. Medial patellofemoral glide stretches are a part of the early rehabilitation. It is also a good idea to do some ITB massage and if there is ITB tightness, use an ITB roller and do some regular ITB stretches. The quadriceps muscles on the front of your thigh are the biggest muscle group in your body and the first to start wasting away. As a rule of thumb, one week of quads wasting requires six weeks of rehabilitation to reverse. So get cracking on those quads right from day one. The best early exercise is straight leg raising and there is no upper limit on how many straight leg raises you can do each day. As simple as it seems, returning to full weight bearing after one week on crutches is a critical milestone. It is important to use the crutches and partial weight bear for the first week. But beyond that, the muscle wasting will occur rapidly if you stay on crutches. Each step you take contracts the quadriceps, hamstrings, calf muscles and starts restoring normal neuromuscular function. Contact us today to make an appointment with Dr Colvin.